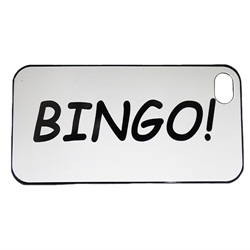 A protective Bingo themed case for your I-Phone. The case will fit an I-Phone 4 or 4s, and 5. It is a solid black piece with a white coating over the back that leaves "Bingo!" printed on the back. The case will fit an I-Phone 4 or 4s. The case will fit an I-Phone 5.